I really like this type of sheet. It offers a number of different options for a number of different aircraft types. Yes, I know that they are all RAF and that they are all 1/48, but it is still nice to have the choice. 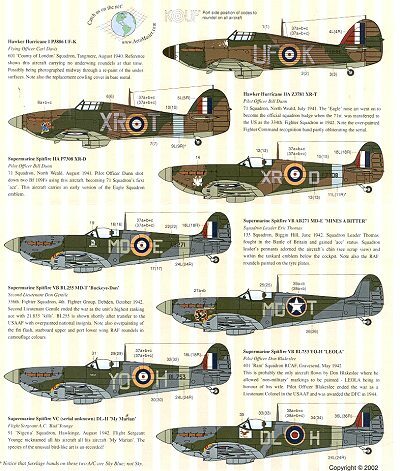 You can do three planes from this sheet with the decals that are included. Two sets of RAF upper wing roundels are on a smaller additional sheet. Of course, you can always scrounge others from various insignia sheets or even use the kit offerings if you need to. The recommended kits are the "Hasegawa/Airfix/Tamiya" families of kits. Didn't know Tamiya did a Hurricane....:o) Several somewhat expensive conversion sets are also recommended. I guess these are to do subtypes not offered in the kit boxes. First is a Hurricane I of 601 sq flown by Carl Davis during 1940. It has a replacement forward cowl section in unpainted metal and carries no under wing roundels. Next is a Hurricane II as flown by Bill Dunn of 71 Sq in July 1941. His carries the eagle nose marking that went on to be used by the 334th FS and is still in use today. The Spitfire II is also a Bill Dunn plane from August of 1941. His carries an early version of the Eagle Squadron emblem on the nose. This and the previous plane have a sky blue fuselage band. Eric Thomas' Spitfire Vb is the next plane and from 133sq in mid-1942. He was squadron leader at the time he flew this plane. The next Spit Vb is the mount of Don Gentile when the plane was transferred to the 336 FS/4 Fg in October of 1942. As you can see, it has US roundels. From 401 sq RCAF is Don Blakeslee's Spitfire Vb from May of 1942. You'll note that this plane has the early roundels and the later camouflage, a most unusual combination. Finally, the Spitfire Vc of Bud Younge who flew with 91 Sq in August of 1942. 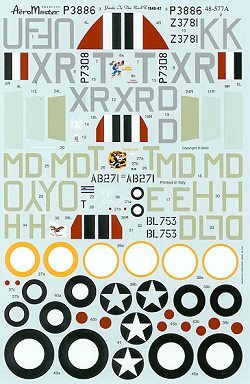 A really nice sheet and one that I hope they also do in 1/72 as I've a bunch of kits that would be most appropriate for it! Review sheet courtesy North American Hobbies, where you can get everything from 20-30% below retail.